Now you see it, now you don't! Three hands on ways to explore missing addends! 1. Paper Slider - Mrs. T.'s First Grade Class had fun figuring out the missing addend with a sliding bar! Click here for details, as well as for lots more awesome activities and printables! 2. Paper Peeker - Our Future is Bright created addition sentences with a mini flap for the missing addend. Visit her blog for a free printable! 3. 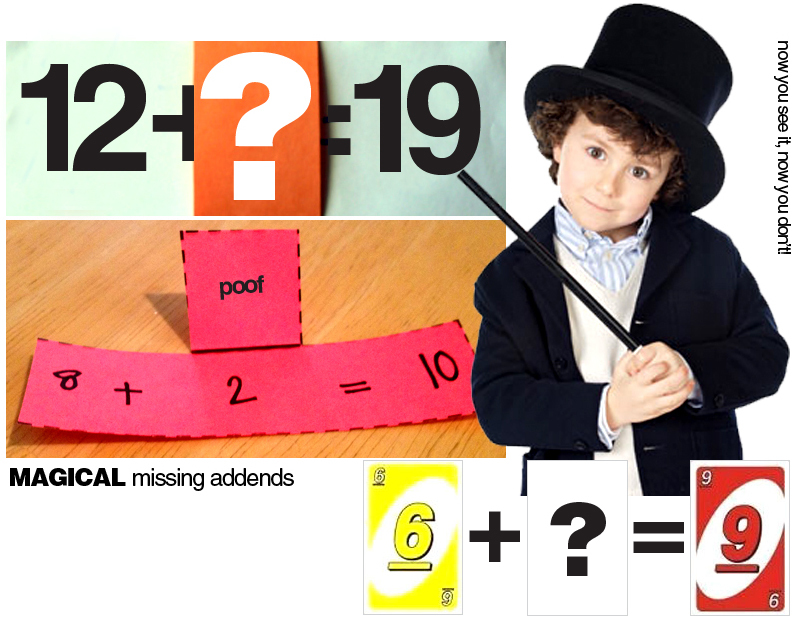 Tell a friend to draw 2 cards and create an addition (or subtraction, multiplication, or division sentence) with a missing addend. Then, magically solve it right before their eyes! Kid Magician via Shizzle Dizzle Magic - Magic Tricks for Teachers! Check it out for fun classroom experiments!